A geological formation on Mount Sodom in Israel overlooking the Dead Sea is called 'Lot's Wife', because of the shape and location of the feature. 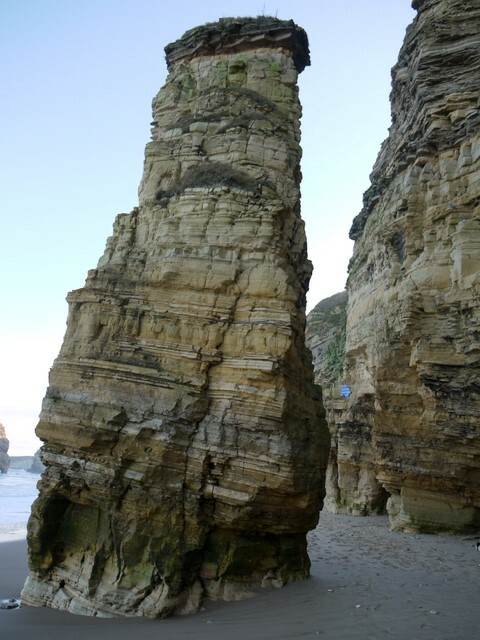 Interestingly, but probably unknown to those who named the Marsden Bay stack shown here, salts of halite and anhydrite also played an important part in the geology of the rocks along the north-east coast. Large amounts of salts were deposited in the shallow tropical Zechstein Sea that extended from the Pennines over to Germany and Poland in Europe during the Permian period. Subsequent dissolution of these salts caused collapse (brecciation) of the overlying Magnesian Limestone rock layers that predominantly make up the cliffs today, providing much of their distinctive appearance and properties. In some locations, between South Shields and Seaham, all that is left of these once several-metre thick layers, are thin residues. A fourth chalk prominence off the western coast of the Isle of Wight, from which The Needles take their nameSZ2984 : The Needles, was also called 'Lot's Wife'. It collapsed in 1764. There is another, similarly named coastal feature in Dumfries & Galloway NX8248 : Lot's Wife and undoubtedly others. are pressed to a brownish bottom stratum. against dark sky between nests and North Sea. This page has been viewed about 1583 times. Can someone confirm this is in the right square. Doesn't look right to me.